CD Ripping or transferring your CDs to your computer’s hard drive has several advantages. For one, it allows you to make duplicate, backup copies of your favorite music as either a pieced-together mix tape, or a complete copy of the original CD. Secondly, it allows you to consolidate your entire music collection into one location on a hard drive, forever eliminating the need to shuffle through your sock drawers to find the long-lost album you’re looking for. In this guide, I’ll show you how to rip a CD for archival purposes on your computer. Once everything is indexed on your hard drive, music sorting programs like iTunes or WinAmp will easily allow you to catalog your favorite tunes. If you’re looking for a quick guide on how to rip or transfer your audio CDs to your computer, it just might be easier than you’d thought, and can often be accomplished without buying any additional software or equipment! If you’re running a version of Windows with Windows Media Player installed, they actually include this feature right in the program. To get started, first check that the computer you’re using comes with a optical disk drive whether that be a CD-ROM, DVD-ROM or Blu-ray player. Also check that you have the latest version of Windows Media Player. For this example, I am using Windows Media Player 12 on Window 7. If you need a new version, you can download it from Microsoft here. The great thing is that Windows Media Player is bundled right along with Windows, so there’s no need for purchasing more software or any large downloads. Once Windows Media Player is installed and opened, you’re ready to get started. First, place the CD you’d like to rip into your CD-Rom drive. Depending on your Windows settings, the disc may start to play right away, or ask you what you’d like to do with it. Go ahead and open up Windows Media Player and navigate to the options panel by clicking Organize –> Options. Once you open the options panel, select the Rip Music tab at the top and you should see something similar to the image below. Here you can adjust settings to fit the project you’re going for including where the ripped files will be placed, what format the ripped audio will be in and quality adjustments. As far as the audio format choices, most of the time people will opt for the MP3 format, as it’s a great format for both saving space and keeping the quality of your music relatively high. However, they also offer lossless formats if you want to preserve the integrity of your music for archival purposes. As for the audio quality slider, you can adjust the output quality of the ripped music. Keep in mind that higher quality generally means large files, so if you’re limited with hard drive space, it might be best to not max out the quality of all of the audio. Once everything is selected to your specifications, press apply, then hit OK. At the main window, all you need to now do is click the button that says “Rip CD”. The resulting audio files will be placed in the directory you specified previously at the options menu. Now, just verify that the audio files play correctly and you’re done! You can use this method to rip all of your music to your hard drive for future mixes, or just for backing things up. When transferring videotapes as a digital files to a hard drive, you have flexibility in choosing the video format that best suits your needs. Depending on what you need the video for, choosing the right video format to use can make your life a bit easier, and save you some time. First, since not all devices and methods are alike, it depends on the method of videotape transfer. For high quality video transfers, you’ll want to capture the video straight to a computer hard drive, using a high speed data port such as Firewire. Firewire usually is recommended for high quality DV-AVI video capturing. This method will provide you with the highest quality files, best suited for editing work and post-production. This is the type of file we provide when you opt for the Edit-Ready AVI File transfer. However, if you do not plan on editing anything in your video, and simply want a video file that is ready to be shared with the world, transferring your file as a web-ready MPEG might be a better option. Using the raw video footage is perfectly fine, but it’s a bit overkill as it’s about 14gb per hour of video which means long upload and file transferring times. For a web-ready MPEG file, you have a few options. You can transfer the videotape to a DVD, then use the footage from the DVD to upload to various social media/file hosting sites. 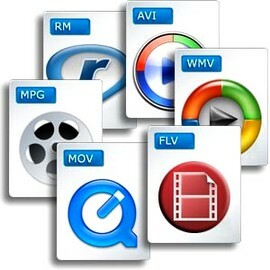 Another option is to capture the video directly to the computer as an MPEG file. MPEG compression is great for web-video because of the small file sizes taking advantage of portability and shorter upload times. No matter which method you choose, you’ll be able to accomplish what you need. Doing it one way or the other will save you time and some sanity, however. For a complete list of recommended video file types, click here! With today’s technology, scanning old photographs and 8mm film can be quick and easy. We all hear about how important it is to back up all of our computer information, or transfer to CD in Orange County or San Diego with us. The importance of backing up all your old photos is no different. The advantages of converting photographs and film is unequaled. Fire, theft, water damage and a host of other unforeseen circumstances can ruin your photos. Your family history, grandchildren, children, weddings, family reunions and proms can be restored and saved for years to come without the threat of being ruined or destroyed. Once you decide to convert your photographs to DVD in San Diego, they can be backed up, saved, sent, and shared with ease and convenience. Photographs can be printed out any time. Your children can make scrap books, you can show your family’s history to your children and their children. All you have to do is collect all your photographs and films. There are now programs that help you convert your old photos with ease. 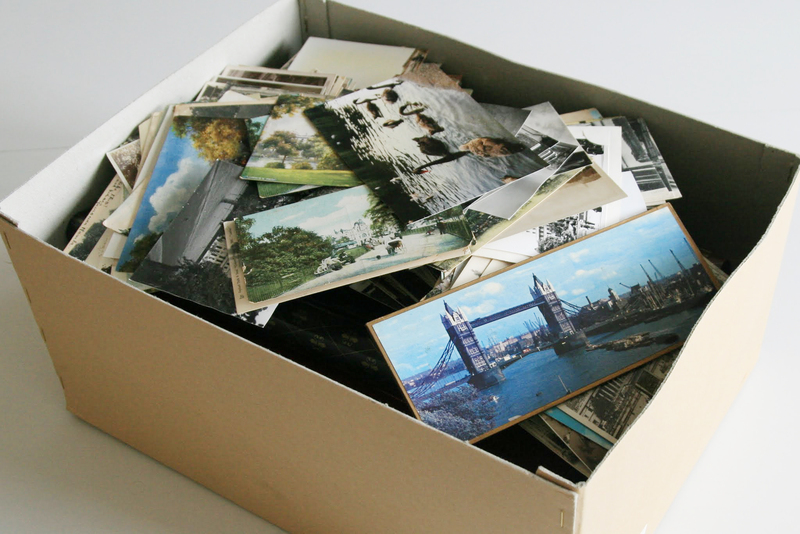 If you save your old photos on digital media you will never have to worry about them again. They will not be lost in a box somewhere or ruined by a fire or flood. Last year a friend of mine was asked by her daughter to send her some of photographs from college. The photos were never seen again. Granted, the postal service paid the monetary value of the photographs, but those pictures will never be seen again and the experience they showed will never be repeated. The photos can be lost, destroyed by water damage, fire, etc… If you preserve those photos on digital media, you never have to worry again about losing them in some kind of accident or disaster. Once your material is digitized, it’s frozen in time. Digital files won’t degrade, allowing you to pass on your family archive in good condition for generations of enjoyment. Store an archival-grade back-up in a safe location or ask us to keep a copy of your files to protect your family history from fire, flood or other damage. Now it’s easy to relive good times – just pop in your personalized DVD and enjoy! No more messing with heavy projectors or hauling boxes out of the closet. And our convenient menus with chapters allow you to jump right to the scene you have in mind. 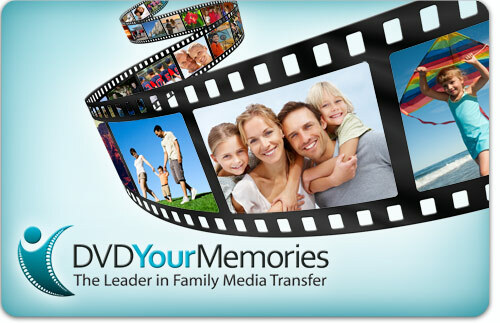 Once on DVD, you can easily share copies of favorite home movies and photographs with family and friends. Or post your new digital files online for all to enjoy. Make it an annual tradition or gift for someone special! Digitizing your family memories allows you to organize and combine all of your photos, movies and recordings into one simple digital archive. Imagine all of those boxes of fragile memorabilia condensed onto a few well-organized discs! With digital files, you have the ability to edit your material for any audience. Many people take their digitized images and create custom edited slideshows in Orange County or San Diego for special events. Don’t like that parade in the middle of your summer vacation footage? Take it out! Want just the highlights? That’s also able to be done. Whether you’re the do-it-yourself type or want to take advantage of a professional editor, a custom edited family video is the perfect holiday gift. Digital technology gives us a range of tools to enhance your material and your final production. Repair & restore aged or damaged photographs; improve the color and brightness of your home movies; clean-up the sound of old records and tapes. For production value, add music, titles & text, special effects and more. Or, for a personal touch, narrate your DVD. Struggling to find the perfect gift this holiday season? DVD Your Memories offers gift cards that can be purchased in our local stores for any amount! These gift cards are good for any of our media transfer services including VHS to DVD transfers, photo scanning, and film to DVD transfers in San Diego. Gift cards are great for gifts to family, or friends that might still be hesitant to convert their media to a modern format. Next time you come in to place or pick up your order, ask one of our friendly technicians about purchasing a gift cards as a gift! Many people are just difficult to shop for, which is why gift cards like these are wonderful! Gift cards aren’t only good for our transfer services, but also good for our service enhancements as well! With many of our media transfer services, we offer upgrades and enhancements to your order such as restoration work, editing, and extra DVD copies of your transfers. For looking through your scanned photo collection, make it even easier on yourself, and add some contact sheets to your order! Simply ask any of our local technicians about the awesome enhancements we can provide to your next slide scanning, photo scanning, or negative scanning order! Part of the reason I was resistant to switching to flash drives was because I expected it to be a lot more expensive than it actually is, or that I’d have to buy way more flash drives than I needed in order to make it affordable. After researching many options, I came across Pexagon Tech. 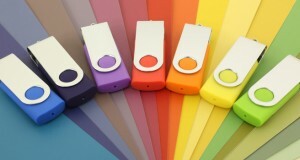 Not only can you customize your flash drive for very little cost, there’s no minimum order. So even if you just need 1 drive, you can still do it at a reasonable price. Awesome. If you’re a high volume studio that offers digital images to many of your clients, you can get a price break by ordering 200 or more, but that wasn’t something I’d do as I only need about 20-30 of these per year. Flash drives can be customized to match your branding by selecting custom colors and by printing or engraving your logo onto the drive. I didn’t realize how much I would love this until I got them in the mail. We went with a swivel drive, with a yellow base and a silver metal cover that swivels around. Our logo was printed onto the metal cover in white and looks super awesome. I like to add a ribbon to my drive to “finish it off” so to speak. What size flash drive should you order? I went back and looked at several weddings we’ve photographed lately and found that 4GB was generally plenty for us, so I ordered mostly 4GB with just a few 8GB drives for those really long wedding days or times when we covered the wedding and rehearsal dinner. Because the price is the same if you buy 1 or 100, this was not a big deal. If you give out digital files regularly, go back and look through your archives to determine the best size for you. You’ll save yourself money by not buying larger sizes than you need, and if your amount varies significantly you can always order several different sizes all in the same order. Gotta love having flexibility! What holds you back from moving to flash drives? With DVDs now practically outdated, what holds you back from switching to flash drives? What are some other alternatives that you have considered using? Leave a comment below and share! I’d also love to see any images to packaging that you’ve come up with if you’re willing to share that as well. Thanks! Also, for full disclosure, I make a small commission if you use the links in the post above, so thanks for using them to make your purchases. It helps support the site.